The goal of our laboratory is to understand how mitochondrial function is coupled to neuronal metabolism. Mitochondria provide 95% of the energy utilized by the brain. In addition to energy production in the form of ATP, mitochondria carry out many other vital functions such as calcium buffering and neurotransmitter metabolism; therefore, their dysfunction underlies many neurological disease states. Although all neurons use ATP, metabolic requirements vary greatly among brain regions, classes of neurons, and even neuronal sub-compartments. We are interested in understanding the interplay between metabolism and mitochondrial function across distinct cell classes in the nervous system under both physiological and pathological conditions. 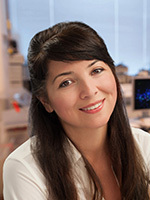 Due to the nature of our interdisciplinary research, we utilize a wide array of approaches combining molecular biology, cell culture, metabolic flux analysis, mouse genetics, neurodegenerative disease models, biochemistry, proteomics, live-cell, and super-resolution microscopy to reveal novel pathways. Pekkurnaz G, Trinidad JC, Wang X, Kong D, Schwarz TL. Glucose regulates mitochondrial motility via Milton modification by O-GlcNAc transferase. Cell. 2014 Jul 3;158(1):54-68. Teodoro RO, Pekkurnaz G, Nasser A, Higashi-Kovtun ME, Balakireva M, McLachlan IG, Camonis J, Schwarz TL. Ral mediates activity-dependent growth of postsynaptic membranes via recruitment of the exocyst. EMBO J. 2013 Jul 17;32(14):2039-55. Pekkurnaz G, Fera A, Zimmerberg-Helms J, Degiorgis JA, Bezrukov L, Blank PS, Mazar J, Reese TS, Zimmerberg J. Isolation and ultrastructural characterization of squid synaptic vesicles. Biol Bull. 2011 Apr;220(2):89-96.